The first DVD player to play both rival high definition DVD formats has been announced by South Korean firm LG. The dual-format player will be able to play the Sony-backed Blu-ray discs and the Toshiba-led HD DVD discs. 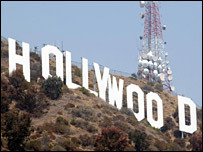 The introduction of two next-generation formats has split both the electronics industry and Hollywood film studios. The player will be launched at the same time as a hybrid double-sided Blu-ray HD DVD disc, developed by Warner Bros. The Total HD discs and the LG player will both go on display at the Consumer Electronics Show (CES) in Las Vegas that starts on 8 January. Players and discs for both HD DVD and Blu-ray went on sale last year. The two technologies are incompatible but offer similar features. Both are able to store much more high-quality data, important for high definition images and high fidelity audio, and both use a blue laser to read information. Used in games consoles, the two formats offer detailed graphics and stunning sound on one disc. However, the launch of the rival technologies has split the industries they serve. Toshiba, with NEC, Sanyo and others, is pushing HD DVD; while backers of Sony's Blu-ray discs include Samsung, Dell and Apple. In Hollywood, companies like Disney and 20th Century Fox have sided with Sony, while the supporters of HD DVD include Universal. Warner Bros, the company behind the hybrid discs, has said it will support both. Analysts have warned that the format war, which has been likened to the Betamax-VHS videotape fight in the 1980s, could cause confusion amongst consumers and impact on sales of both technologies. The new player and discs could allay these fears. Both would mean that consumers would not be forced to choose between rival formats and risk investing in an expensive technology or DVD library that could rapidly become obsolete. No prices or release dates for the technologies were announced.